Historically, many shelters have routinely admitted more healthy cats than could be placed into adopive homes. While the intention behind this practice has been to protect both cats and communities, the result has been chronically over-crowded shelters and the deaths of many millions of cats. At one time, this was seen as sadly inevitable. However, new research and innovative programs suggest that there are humane and cost effective alternatives to this traditional approach. These strategies can virtually eliminate both shelter crowding and euthanasia of healthy cats, and include spay/neuter/return programs and scheduled/managed intake to shelters. A holistic approach to unwanted and free-roaming cats allows shelters to focus on positive, life-saving programs that account for the needs of pets, wildlife and people in our communities. Below are some of the most frequently asked questions about these new approaches. 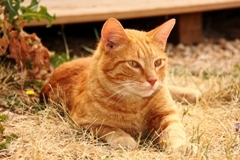 If euthanasia of healthy cats is not considered an acceptable option and the number of cats presented to a shelter exceeds the number of adopive homes, this leaves two basic possibilities: 1) adding alternative live outcomes for cats admitted to the shelter (generally in the form of sterilization and release to a non-housed environment, e.g., trap-neuter-return), or 2) deferring or declining intake in the first place. For any possibility, we must bear in mind what real alternative options exist. Even if there are concerns or problems associated with new approaches, we need to consider whether they are preferable to the current situation, rather than whether they represent flawless solutions to all the many issues associated with free-roaming or abandoned cats in our communities. What if shelters or communities can't afford trap-neuter-return for all cats? Couldn't greater efforts be made to find adopive homes for all cats entering shelters? Community cats also contribute to the difficulty of finding homes for all the non-feral cats entering shelters. According to the American Pet Products Manufacturer's Association survey (2005), about 15% of dogs and cats were obtained from animal shelters. However, 34% of cats compared to only 9% of dogs were obtained by adoping an animal found roaming as a "stray". By contrast, 31% of dogs compared to only 3% of cats were obtained from breeders. When shelters succeed in increasing adoptions, some people may choose a shelter pet rather than adoping or purchasing from another source. Breeders can respond by decreasing the number of litters produced if demand declines. However, a negligible number of cats are obtained from breeders. A decline in "demand" for stray cats will not similarly reduce their population; in fact, strays that otherwise might have been adopted off the street may well end up in shelters, further increasing intake numbers. In some cases, simply leaving friendly stray cats where they are, or performing TNR and replacing them in the community, may increase their chances of finding a new home rather than being euthanized in an overcrowded shelter. If shelters limit intake of unwanted cats, what are people supposed to do if they have a pet cat they can't keep? In the United States, we have been accustomed to the idea that the best thing for an unwanted cat is to be surrendered to a shelter. When the shelter is reasonably sure of finding the cat an adopive home or providing it with lifelong humane care, this is certainly the case. However, we now recognize that admitting more healthy cats than can be released alive over time does not necessarily serve cats, communities or shelters well. Some pet owners will surely be frustrated by the shelter's inability to take in their pet, but with some encouragement may discover other options that might not be perfect solutions but are preferable to euthanasia. Meanwhile, if the shelter maintains a population of cats within the reasonable capacity of the organization to provide care and find homes, cats will be healthier, staff will be better able to serve the public, medical and euthanasia costs will be reduced and adoptions are likely to increase over time. By waiting to serve cats until there is space and the guarantee of a positive outcome, more cats and community members may ultimately be served. AVMA, U.S. Pet Ownership & Demographics Sourcebook. 2012, Schaumberg, IL: American Veterinary Medical Association. Chu, K., W.M. Anderson, and M.Y. Rieser, Population characteristics and neuter status of cats living in households in the United States. J Am Vet Med Assoc, 2009. 234(8): p. 1023-30. Levy, J.K. and P.C. 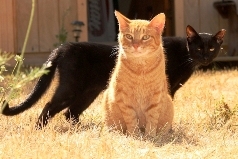 Crawford, Humane strategies for controlling feral cat populations. J Am Vet Med Assoc, 2004. 225(9): p. 1354-60. Manning, A.M. and A.N. Rowan, Companion animal demographics and sterilization status: results from a survey in four Massachusetts towns. Anthrozoos, 2005. 5(3): p. 192-201. Marsh, Replacing Myth with Math. 2010. Wallace, J.L. and J.K. Levy, Population characteristics of feral cats admitted to seven trap-neuter-return programs in the United States. Journal of Feline Medicine & Surgery, 2006. 8(4): p. 279-284. Mahlow, J.C., Estimation of the proportions of dogs and cats that are surgically sterilized. J Am Vet Med Assoc, 1999. 215(5): p. 640-3. Shelter Statistical Survey. National Council on Pet Population Study and Policy, 1999. Local Rabies Control Activities. [cited 2012]; Available from: http://www.cdph.ca.gov/HealthInfo/discond/Pages/LocalRabiesControlActivities.aspx. Lord, L.K., et al., Demographic trends for animal care and control agencies in Ohio from 1996 to 2004. J Am Vet Med Assoc, 2006. 229(1): p. 48-54. Morris, K.N., J.L. Wolf, and D.L. Gies, Trends in intake and outcome data for animal shelters in Colorado, 2000 to 2007. J Am Vet Med Assoc, 2011. 238(3): p. 329-36. Scott, K.C., J.K. Levy, and P.C. 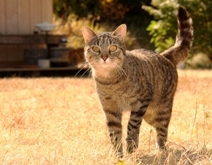 Crawford, Characteristics of free-roaming cats evaluated in a trap-neuter-return program. J Am Vet Med Assoc, 2002. 221(8): p. 1136-8. Lee, I.T., et al., Prevalence of feline leukemia virus infection and serum antibodies against feline immunodeficiency virus in unowned free-roaming cats. J Am Vet Med Assoc, 2002. 220(5): p. 620-2. Luria, B.J., et al., Prevalence of infectious diseases in feral cats in Northern Florida. J Feline Med Surg, 2004. 6(5): p. 287-96. Wenstrup, J. and A. Dowidchuk, Pet overpopulation: data and measurement issues in shelters. J appl anim welf sci, 1999. 2(4): p. 303-319. Levy, J.K., D.W. Gale, and L.A. Gale, Evaluation of the effect of a long-term trap-neuter-return and adoption program on a free-roaming cat population. J Am Vet Med Assoc, 2003. 222(1): p. 42-6. Lord, L.K., Attitudes toward and perceptions of free-roaming cats among individuals living in Ohio. J Am Vet Med Assoc, 2008. 232(8): p. 1159-67. Schmidt, P.M., R. Lopez, and B. Collier, Survival, Fecundity, and Movements of Free-Roaming Cats. Journal of Wildlife Management, 2007. 71(3): p. 915-919. Inc., N.R., APPMA National Pet Owners Survey. 2005, American Pet Products Manufacturers: Greenwich. Nutter, F.B., J.F. Levine, and M.K. Stoskopf, Reproductive capacity of free-roaming domestic cats and kitten survival rate. J Am Vet Med Assoc, 2004. 225(9): p. 1399-402. Fan, M., Y. Kuang, and Z. Feng, Cats protecting birds revisited. Bull Math Biol, 2005. 67(5): p. 1081-106. Courchamp, F., M. Langlais, and G. Sugihara, Cats protecting birds: modelling the mesopredator release effect. Journal of Animal Ecology 1999. 68: p. 282-292. Levy, J.K., Considerations and management of infectious disease in feral cats, in Infectious diseases of the dog and cat. C. Greene, Editor. 2011, W. B. Saunders Company: Philadelphia. p. 1136-1138. Lord, L.K., et al., Search and identification methods that owners use to find a lost cat. J Am Vet Med Assoc, 2007. 230(2): p. 217-20. Lord, L.K., et al., Search methods that people use to find owners of lost pets. J Am Vet Med Assoc, 2007. 230(12): p. 1835-40. Lord, L.K., et al., Characterization of animals with microchips entering animal shelters. J Am Vet Med Assoc, 2009. 235(2): p. 160-7. Purina, R., The State of the American Pet. 2000. Miller, L. and S. Zawistowski, Chapter One: The Evolving Animal Shelter, in Shelter Medicine for Veterinarians and Staff. 2004, Blackwell Publishing: Ames, Iowa. Clifton, M., U.S. shelter killing toll drops to 3.7 million dogs & cats. Animal People, 2007. p. 18-19. Chu, K. and W.M. Anderseon, U.S. Public Opinion on Humane Treatment of Stray Cats. 2007, Alley Cat Allies: Bethesda, MD. p. 6. Kate Hurley is the director of the UC Davis Koret Shelter Medicine Program. 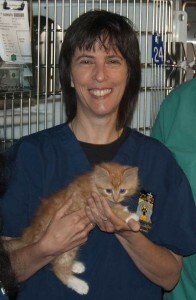 Dr. Hurley began her career as an animal control officer in 1989. After graduation from the UC Davis School of Veterinary Medicine in 1999, she worked as a shelter veterinarian in California and Wisconsin. In 2001, she returned to UC Davis to become the first in the world to undertake a residency in Shelter Medicine. Following completion of the residency, Hurley became the director of the UC Davis Koret shelter medicine program. Two of her proudest achievements are co-authoring the Association of Shelter Veterinarians’ Guidelines for Standards of Care in Animal Shelters and co-editing the textbook Infectious Disease Management in Animal Shelters. She loves all things shelter-related, but her particular interests include welfare of confined dogs and cats, humane and effective strategies to manage community cats, infectious disease and unusually short dogs. She loves shelter work because it has the potential to improve the lives of so many animals and the people who work so hard to care for them.